I don’t know why, but I assume that cooking good quality food has to be complicated… and so hard that half of your kitchen has exploded and you’ve singed off your eyebrows by the time your done. Well, my friends, it doesn’t have to be that way! This recipe, which I’ve adapted from “Woman’s Day” is about as easy and clean as it gets. I think this is even easier to make than Kraft Macaroni and Cheese. And, it’s good too! Like, really good. Balsamic vinegar to drizzle on at the end. 1. Preheat the oven to 500F. Line a rimmed baking sheet with foil. 2. Spread meat and veggies onto the pan. Drizzle with oil and sprinkle with garlic, rosemary, salt and pepper. Toss to coat. 3. Roast 15 min. 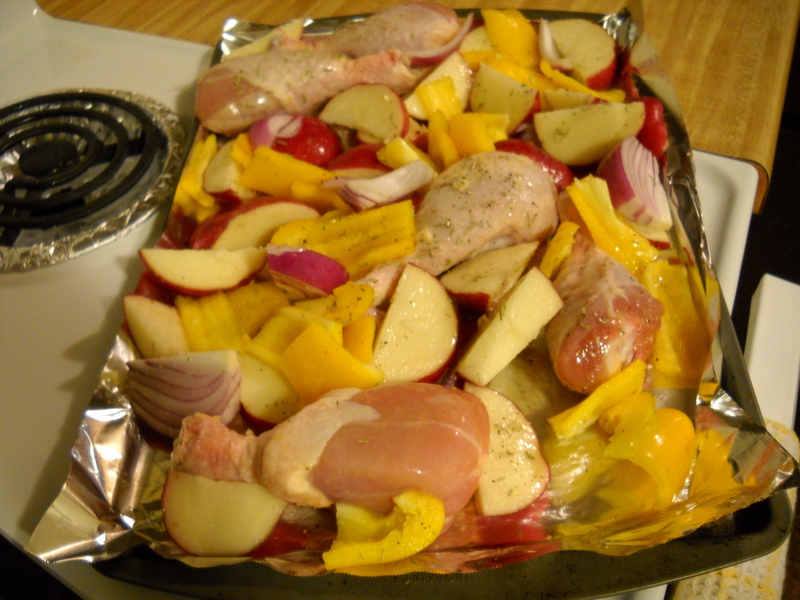 Remove from the oven, toss, and roast another 15 min, or until the chicken is cooked and the potatoes are tender. 4. Remove from the oven. Drizzle with balsamic vinegar and olives. This entry was posted on October 28, 2010 by sanozababydesign. It was filed under Poultry, Vegetables and was tagged with Bell Peppers, Drumsticks, Easy, Garlic, Italian, Oven-roasted, Recipe, Red Onion, Rosemary.